Last night I started a new project; Moon Flowers by Mirabilia. 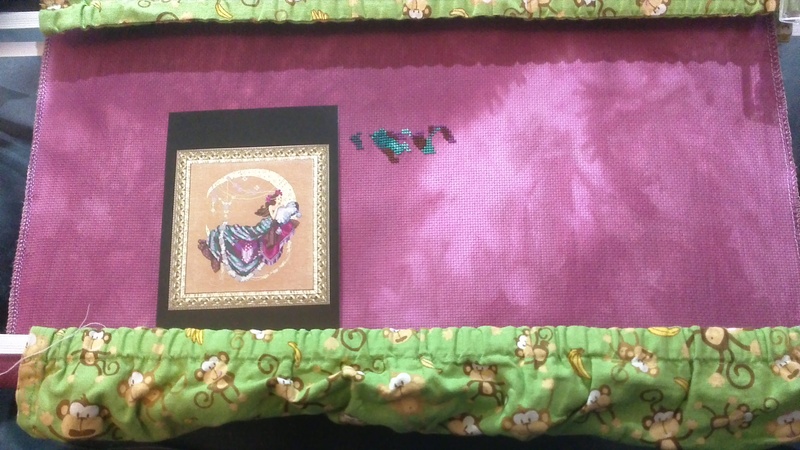 I am stitching her on 16ct Aida Black Magic by Under the Sea fabrics. This fabric turned out exactly how I envisioned it for Moon Flowers. I am typically not a dark fabric kind of gal, but when I first saw Moon Flowers, I knew Black Magic would be the perfect fabric. And Leslie didn’t disappoint. I am so excited to start stitching on this one. What new project are you looking forward to getting started on? Cool start. It’s going to be fabulous! Beautiful fabric and design. I generally have not used hand dyed fabrics, mostly because I have so much stash already. But this is just so beautiful. Thank you Helen. It definitely is hard for me to find the right hand dyed fabric, but once I do, that’s it. There is no changing my mind. Dark is different for me, but it will be awesome. Hannah, I knew this was the color for this project as soon as I saw it. Can’t wait to make some real progress on this one. I love a new start, love your other post stitching too. Thank you Amanda. It is a nice feeling to start a new project. This will be a great project! Can’t wait to see updates. The fabric is perfect. Thanks Johanna. Right now it’s slow going. Lots of changing colors. Thanks, Fawn. They really are beautiful colors all together.